It continues to be an awful season for the Milwaukee Bucks as they are the worst team in the NBA with a 5-20 record. While the franchise might be disappointed with the Bucks success so far, fans on the other hand are happy. With one of the deepest drafts expected to take place in 2014, this is a perfect time for them to be struggling. Last week I gave the top four prospects that the Bucks should select in the 2014 NBA Draft if they receive one of the top picks, and now it is time to see if those four players still remain in the top four. 1. Jabari Parker – SF – Duke: Jabari Parker has earned the right to be the top prospect the last two weeks, as he as been the most dominating player in college basketball this season. He is a great scorer and in his two games this past week he showed it averaging 22 points per contest while shooting an average of 56 percent from the field and 50 percent from behind the arc. In his game against UCLA he did it all scoring 23 points while grabbing 10 rebounds and recording five assists. His stock continues to remain high, and if he continues to produce the way he has in the first five weeks of the season, he will be the most sought after prospect in the upcoming draft. 2. Andrew Wiggins – SG – Kansas: Andrew Wiggins only played in one game this week, and he would have been better off just sitting on the bench. While Wiggins possess all the tools to make him a great NBA player, he has not proved that in his first 10 games this season. His performance has been up and down all season, and on Saturday night he was really struggling to do anything against New Mexico at home. In 28 minutes of action he made only three of his 11 shots from the field scoring a total of 11 points, while securing four boards and recording four personal fouls. Wiggins’ stock is falling as he has not performed to the level many people thought coming into the season. Although he remains the number two overall prospect for the Bucks, if he continues to struggle offensively like he did this week, you will see him fall in the rankings. 3. Joel Embiid – C – Kansas: The Milwaukee Bucks already have Larry Sanders projected as their starting center for the seasons to come, but his lack of performance and off the court issues have caused people to be concerned. While drafting a center might not fill a need as of now, Embiid continues to put his name in the conversation with his consistent high level of play. In his lone game against New Mexico he played in 25 minutes while shooting 83.3 percent (5-6) from the floor and 80 percent (8-10) from the charity strip for a total of 18 points. He also added six rebounds, four blocks and three steals for an all around great performance. While he needs to add more strength to his frame, and could use more in game experience, his stock continues to rise after another outstanding performance. 4. Marcus Smart – PG – Oklahoma State: Marcus Smart returned for his sophomore season to improve his game, after last year when he could have been a top three pick in the draft. This decision has hurt Smart so far because he has not taken his game to the next step like many people thought he would. This week he played in two home games against non-conference opponents, Louisiana Tech and Delaware State, and had two awful showings. In the two contests he averaged about 30 minutes of action while scoring 10.5 points per game on 46.2 percent shooting from the field and 25 percent from distance. He did record at least three rebounds, assists and steals in each game, but he turned the ball over a combined eight times in the two games. Smart stock is falling after last week when he ranked as the third best prospect for Milwaukee, and while he would make a lot of sense for them, he has not been performing up to the level that a top pick should be playing at. 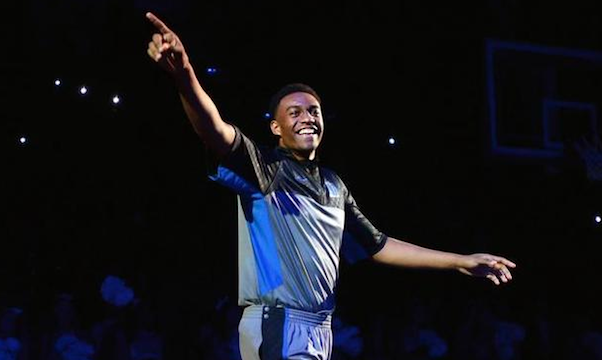 The 2014 NBA Draft is still a long ways away, but as of now Jabari Parker is the player that is the most deserving of being selected number one, while Andrew Wiggins’ stock continues to fall. It will be another interesting week of college basketball, and make sure to check back next week to see if Joel Embiid is able to overtake Wiggins for the number two spot and if Marcus Smart falls out of the rankings.